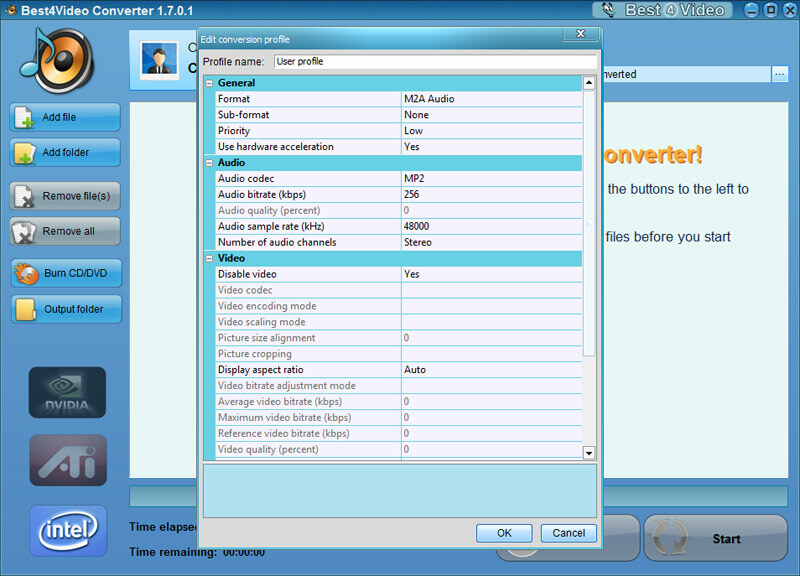 Best4Video Audio Converter is a perfect software to convert any audio files. This potent conversion tool supports wide range of popular audio file formats, including MP3, OGG, AC3, FLAC, WAV, WMA, etc. and ensures fast conversion speed and perfect output quality. With the help of Best4Video Audio Converter you will effortlessly convert your favorite music for any popular device, such as iPad, iPod, iPhone, PSP, iRiver, Zune, Archos, and many others. Best4Video Audio Converter is user-friendly software with simple and handy interface which makes it extremely convenient to use. Audio conversions of all kinds can be performed with just a couple of mouse clicks — you just need to choose an output audio format and quality depending on your own needs and predilections, and Best4Video Audio Converter will do its best to let you enjoy your favorite music whenever and wherever you want. User-friendly tool: easy to install and convenient to use. All kinds of audio conversions are performed effortlessly with a couple of mouse clicks. Clear interface: convert your audio files with just a couple of mouse clicks. Support of a wide range of portable devices: iPod, iPhone, iPad, PSP, Zune, Mobile phones, Smart phones, Archos, Creative Zen, iRiver, Google Android, Palm, Blackberry, Sony Walkman, SanDisk Sansa. Support of all popular audio file formats: MP3, OGG, AC3, FLAC, WAV, WMA, M2A, AMR, etc. Tweakable output settings: you can choose output format and quality (bit rate) according to you own needs and preferences. 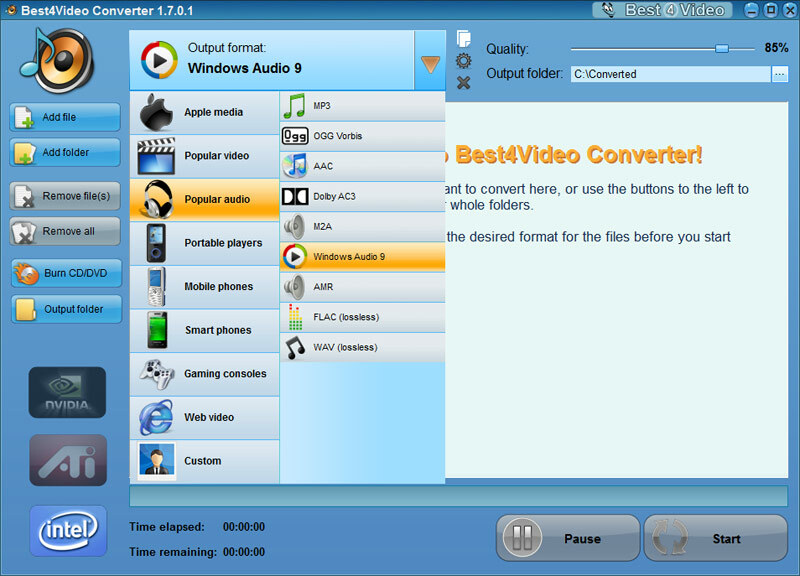 Really fast conversion: Best4Video Audio Converter saves your time, providing maximum possible conversion speed. Great output quality: all audio files are converted with the best possible quality. Batch conversion mode providing the ability to convert large music collections quickly and easily. 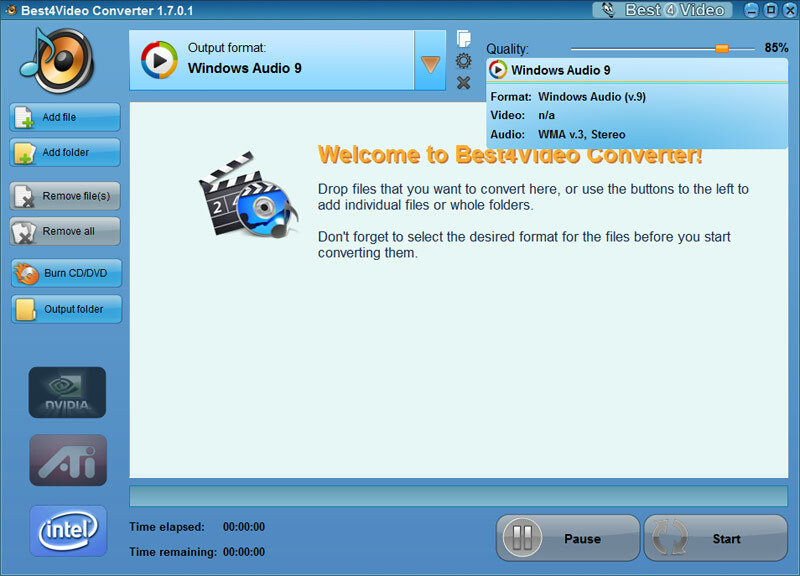 Best4Video Audio Converter was made to provide the best way to perform any kind of audio conversions. You do not need to hassle yourself with the problems of incompatibility of your music files and favorite devices — with the help of Best4Video Audio Converter you will solve those problems with just a couple of mouse clicks and enjoy your favorite songs anytime and anywhere without limitations.